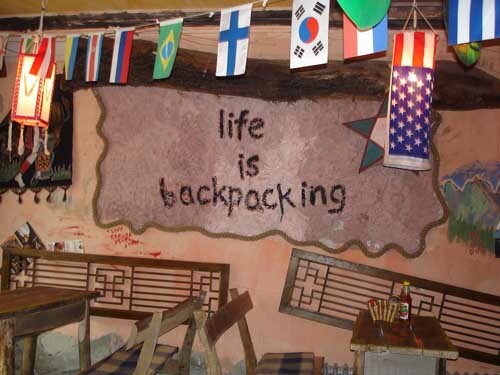 Backpacking is a term that has historically been used to denote a form of low-cost, independent international travel. Terms such as independent travel and budget travel are often used. Isn’t backpacking all about staying at down-at-heel dumps with cold or no water for showers, eating in grubby canteens, mixing with a crowd that’s definitely not top drawer and being generally uncomfortable? Surely the Indian mind recoils at the very idea? 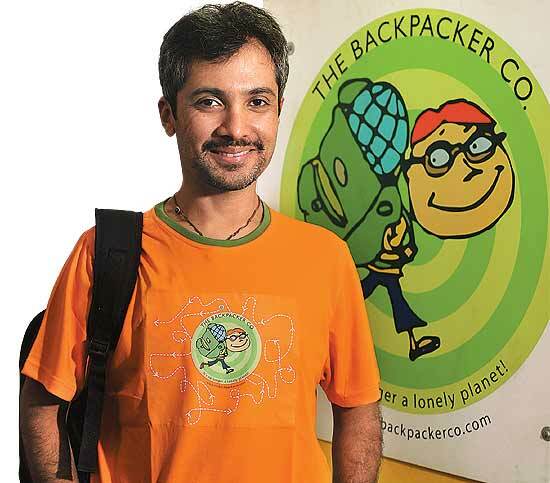 Backpacking now is not about those things and maybe never has been, says Yogesh Shah, CEO of The Backpacker Company (www.thebackpackerco.com), India’s first travel resource that assists independent travellers across Europe, Australia, New Zealand and the US. SO HOW DID THE BACKPACKER CO START? -Yogi Shah,an HR college graduate wanted to explore the world beyond Mumbai.Like any self respecting Gujarati,he had his 10 year multiple entry visa ready even before he discovered he liked travelling. -He had his passport and visa ready at all times,yet he just didn't know how to go and where.When he was 20,an acquaintance told him about his plan to backpack in europe. -With the money he had saved working in his family's logistic business,shah took off. "It was supposed to be a 15 day holiday,which turned out to be of two months". -This was nothing like his earlier trips -for one there was no time boundaries with his itinery. -The feeling stayed at the back of his mind until 2004,until the husband and wife duo glimpsed a business opportunity in trying to make the experience work for others too. 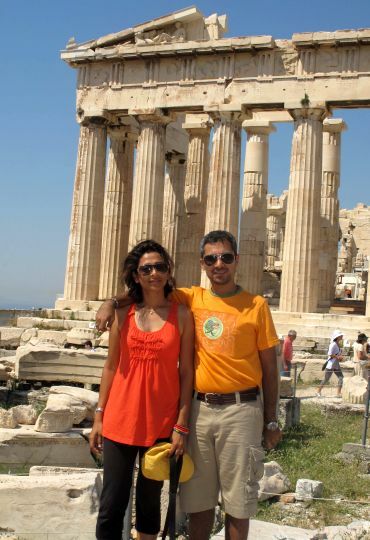 THE TRAVEL EXPERIENCES THEY HAD..
-“We wanted our travellers to experience what we had—to explore, not just sightsee,” says Yogi, who worked in his family’s logistics business before venturing out on his own. 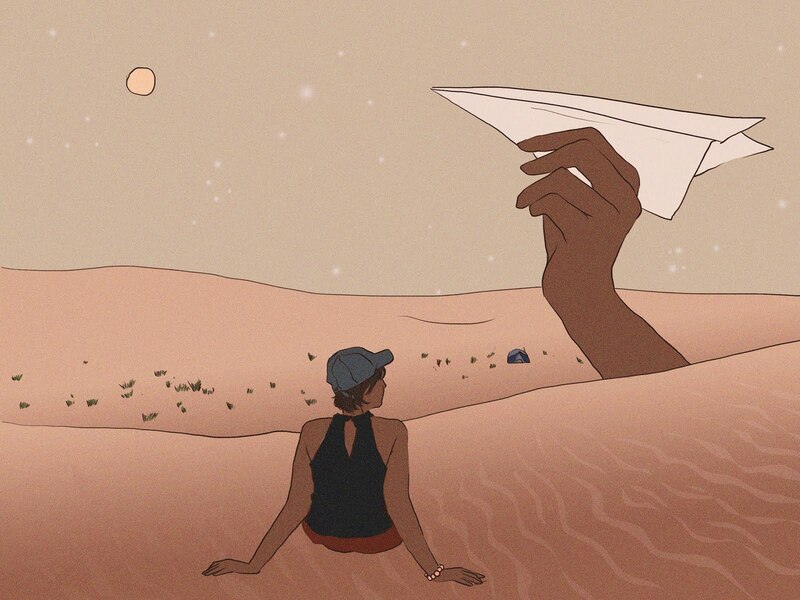 -As a flight attendant with Singapore Airlines, Suchna, too, had explored the new cities she’d constantly find herself in. Before they founded the company, Suchna and Yogi had, between them, extensively holidayed across the world. -“Even when we weren’t married, friends, or friends of friends, would ask us to help them plan their trips. We loved doing it. One day, we thought we might as well make money from doing this,” laughs 33-year-old Suchna, who moved back to Mumbai after five years of working with the airline in Singapore. SETTING UP THE BACKPACKER CO.
- Armed with a seed fund of Rs 10 lakh (rustled up with help from friends and family), and many, many happy travel memories—the “real know-how and capital” for the business—they set up shop in their Bandra home, and would hop across to the nearest coffee shop for client meetings. -In the first year, they sent 60 people to Europe and New Zealand, and have steadily grown by more than 100 per cent every year since. Now, they handle around 400 itineraries every year and have a turnover upwards of Rs 1.5 crore. -Though work space has shifted to a decent-sized office in Andheri, accommodating 12 fulltime employees, the couple still do much of the research themselves. - Yogi and Suchna say they have never advertised, and their name has travelled to their target audience, mainly the 20-40 age group, through word of mouth, and media write-ups “now and then”. -Of course, there have been low days. “It still feels terrible when we get calls and people ask us about backpacks. They think we sell bags,” exclaims Suchna. But, the high of seeing people discover themselves on trips makes it all worth it, she adds. -Schooling at Bombay Scottish and a commerce degree from HR college in 1991 preceded a comfortable job at his father's logistics company, Senior Translines. -The best part of the job description, of course, was the luxury of spontaneous sabbaticals. -His father made it clear to him that his trips would have to be self-financed with his salary —using company funds was out of the question. -And so began the innumerable trips, primarily to the Mediterranean and other parts of Europe. On each trip, Yogi would make a beeline for the local hotspots and places of interest, and keenly jot down the details in a travel journal. -He and his wife Suchna - also a compulsive nomad - found themselves besieged by friends and friends-of-friends seeking advice on how to plan their holidays. -Their eventual success set them thinking on starting a consulting service for experience-seekers? They were getting a good number of referrals, and the next logical step seemed to take it to an organised level. -Having worked out a price structure that people would be comfortable with, they started The Backpacker Co.
-Working out of their residence was a conscious plan to keep overheads low - all Yogi bought were two computers to get started with. 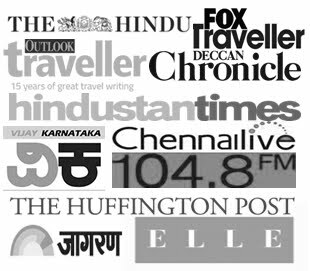 They relied on spreading awareness through word of mouth publicity - meeting travelling enthusiasts at coffee shops in Mumbai to discuss mutual experiences and organise travel plans. -In 2005, they not only broke even, but also made their first million. -Four years later, today, with a staff of eight handling between 80 and 90 enquiries a week, The Backpacker Co. is a much-changed entity. HOW IS THE BACKPACKER CO DIFFERENT FROM REGULAR TRAVEL AGENCY?? -UNESCORTED: The Backpacker Co is an independent travel company, specializing in ‘unescorted’ backpacking trips. It differs from a regular travel agency in many ways. One can have an extremely flexible holiday planned with The Backpacker Co.
-NO FIXED TIME LINE: Unlike packaged tours, where there is a fixed time-table (get up at seven, twenty minutes at the Louver…) and limited food-menu, the Shahs plan the trip according to the budget, timeline, and interests of the client. Keeping these factors in mind, they custom-package the client’s tour in the most economical way—where they could stay in youth hostels, bed and breakfast, doing their own cooking at kitchenettes, etc. -While they also sometiimes go to the extent of arranging the ticketing, forex, et al; it is okay with them if the client says that they themselves would like to do some of these tasks. In a gist, what these globetrotters do is use their knowledge and experience to make their client’s trips worth every penny. -“We make arrangements for our clients to become a part of local festivals that happen abroad. For instance, we have some people headed to Spain in the month of July. This is when the famous ‘Pamplona Bull Run’ happens at the festival of San Fermin. We have ensured that these people will be there to have an experience of a lifetime,” says Yogi Shah. Cooking holiday in Tuscany (Italy), single-malt trip at the breweries in Scotland, vineyard trips in Champagne—they do it all. -The Backpacker Co is the first backpacker-centric company in India, and hence has the first-mover advantage. Firsthand experience of having traveled all over the world and the knowledge that comes with time is one other strength of the company. -Besides this, they have some eminent partners across the globe, with whom the company has signed exclusive contracts for India. Also, the training passed on to the team is an asset in this very personalized business format. 1)The Backpacker Co is for those who want to go on long, fun trails and holidays that help experience culture. 2) The husband-wife duo also runs ‘Away and Beyond’ for the discerning, who would like only the best. The latter also arranges family trips keeping in mind children’s needs. 3)A customer can sign up for its already planned trips – announced on the Internet – or ask for customised tours. In the case of the latter, the team does a recce before organising the trip if the destination is new. 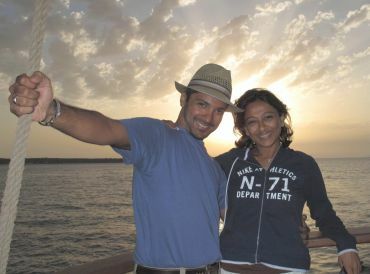 The duo’s travel experience over the years has enabled them to set up a network of people at the destination locations to ensure smooth travel experience. 4)Girlfriend Getaways – one of the options that it offers are becoming popular. 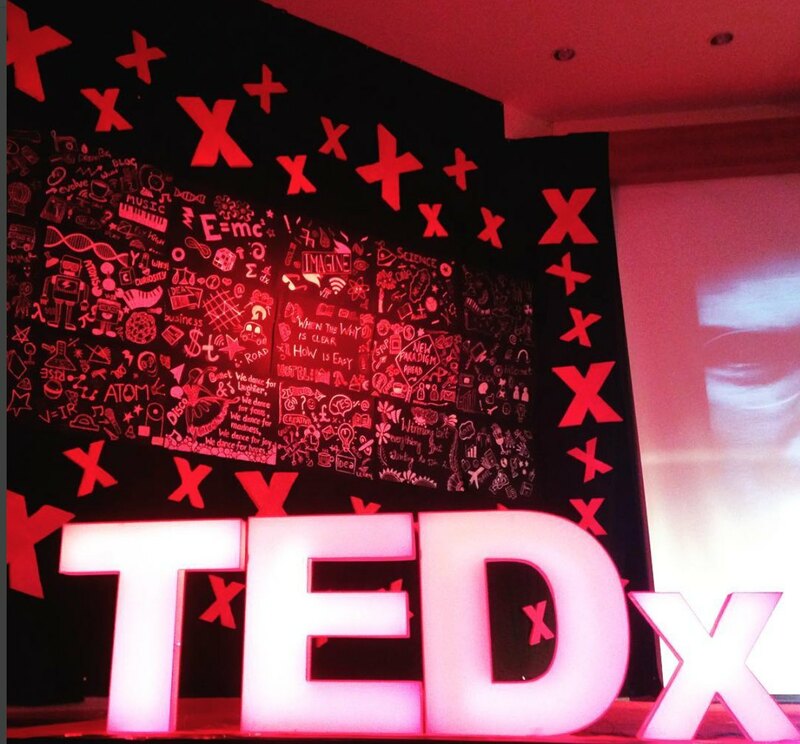 “In fact, women are more adventurous, and they constitute 65 percent of our clients,” admits Shah. HOW THE DUOS WORK TOGETHER? -Even as they navigate through these experiences—and through country maps, road networks and bus schedules—the easy camaraderie between the couple, now parents to six-year-old Ariyana and two-year-old Agastya, is more than evident. There are plenty of laughs, jokes and good-natured ribbing. But, has taking the home to office, and making the office a part of the home decor really been such an effortless expedition? -According to Yogi, the trick is to make the differences count. 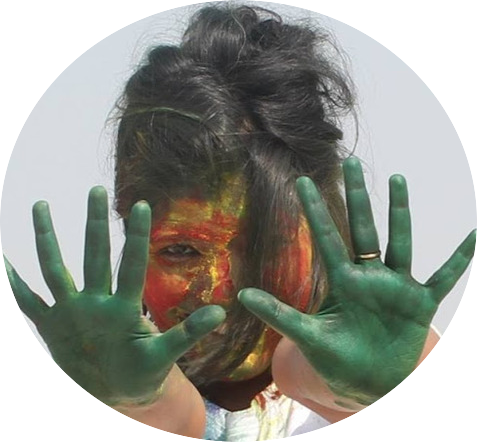 “Suchna is very meticulous. So, she handles the back end, number crunching, and administration. I handle marketing and branding. We do, however, sometimes step on each other’s toes,” he admits. -“There are times when we want to strangle each other,” Suchna pitches in. “Our staff knows by now that when one of us has an arched eyebrow, it’s a good idea to steer clear of our cabins.” Keeping the bedroom and boardroom from intruding into each other was tough at the beginning, and even now it’s something they work on consciously. For example, there is no decision-making talk done at home. “When you are home, you are home,” says Yogi. -Yogi confesses there are disadvantages to working together, but says you have simply got to weigh what you have. “Wouldn’t you rather travel with your wife and spend this much time with her than anybody else?” he asks, pointing out that a trip to Finland they took earlier was also “their best holiday together”. The constant travel hasn’t yet worn down the wanderlust, with the duo looking forward to someday backpacking across South America, a long-time dream destination. -For now, the partners in life and business are getting ready to enter another marriage of sorts. “We want to be India’s number one experiential travel company in the next five years,” says Yogi. For that, the company needs a capital infusion of Rs 3 crore to Rs 5 crore. -Both love Europe as a travel destination; his favourite city is “Barcelona, which is simply mind-blowing; it is so full of life and I love the level of activity there. 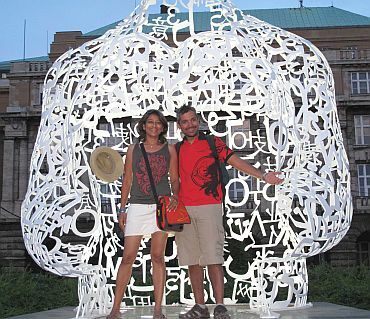 When we travel, we don’t have a sense of structure and spontaneously get onto a bus and explore the place,” says Yogesh. 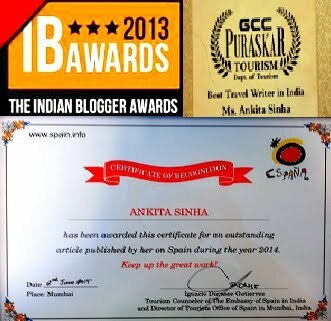 -But Suchna’s favourite haunt is Paris, for several reasons. “There is so much to do there and yet you can do nothing too! I remember an entire day I spent in Paris just sitting in a park with a baguette, a bottle of wine and a great book to read. I love people-watching; it’s so much fun and helps you to really discover the place,” she says. -Also, in Paris she loves going to the smaller art galleries as well as the Jardin du Luxembourg (the Luxembourg Gardens) “where it looks like the entire city of Paris comes to read and relax.” Her first trip here was in 1998 and she tries visiting it “every two years to recharge my batteries”. 1)First you need to be patient. If it's a start-up it won't take off immediately. Give it some time. 3)Three, if something doesn't work, try doing it differently. You must constantly innovate to stay ahead. 4)Four, find a mentor in the industry who will guide you in the right direction. 5)And finally work hard. Cliched as it might sound, there really isn't any substitute for hard work."